TAO GROUP BLOG TAO NIGHTCLUB LAVO NIGHTCLUB TAO BEACH LAS VEGAS: STARS DINE AT LAVO! Last night at LAVO Janet Jackson and Jermaine Dupri quietly celebrated Jermaine's Birthday with a group of 30 friends in LAVO's plush private dining room. The group included Janets backup dancers for her current world tour and friend and rapper Bow Wow. Janet and JErmaine slipped in quietly and stayed for about 2 hours dining on a special menu from Chef Ludo. 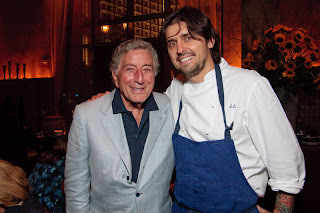 Also having dinner last night was the legendary Tony Bennett, who was dining with his daughter and 3 guests. Afterwards Lavo owner Jason Strauss gave the group a private tour of the nightclub before it opened.